Argueably the most memorable film music of the last 10 years came from Peter Jackson's THE LORD OF THE RINGS trilogy by Howard Shore. Could Jackson's very next project, KING KONG, come anywhere near the success of the Rings even in terms of its score? If that question was originally without merit, that changed the moment composer Howard Shore dropped out off of the King Kong project and James Newton Howard was brought on board to provide the musical backdrop to this beauty and beast remake. Undoubtedly, James Newton Howard has built up a strong enough portfolio to warrant being hired to score this picture in the first place, but still could easily be haunted by the question heard in the minds of some film music fans, "It's good, but what would Shore have done?" The overall tone of the score is unsurprisingly romantic and adventurous - something James Newton Howard is no stranger to. Still, Howard's score ranges from 1930's period music, to adreniline-packed, action pieces, to dark and mysterious melodies, to the tender, to the pitiful, without batting an eye. Such variety helps to make the pictures 3 plus hour running time doable and also make the 74 minute soundtrack an easy listen. 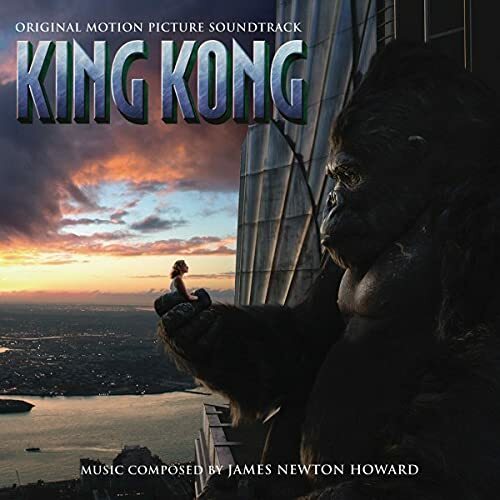 James Newton Howard successfully conveys the sheer power and might of the great King Kong in pieces such as "Something Monstrous...," "Captured," and "Tooth and Claw." Yet he also gives the big fella (and likewise the film) a sensitive heart with his use of his "beautiful-theme" in "Beautiful" and "Central Park." Howard's work goes a long way to helping the audience connect with Kong on a sympathetic level as much as Andy Serkis's digital performance, and Peter Jackson's direction does. The concluding piece of the film found in tracks 20 and 21, Beauty Killed the Beast IV, V, is truly some of the most emotional music of 2005. Just as KING KONG, the movie, had an almost impossible standard to live up to, so did it's score. Thankfully, in the skilled hands of Peter Jackson and James Newton Howard, both movie and score have done just that.